I have been making a lot of DIY recipes at home. So whenever an opportunity or idea strikes me, I do give it a try. V & I are quite fond of Jalapenos and love the spicy flavour it adds to the pizza. It’s my go-to topping for almost every pizza I make. While I was shopping for vegetables one day, I suddenly thought of using the big-sized chilli to make Jalapenos. I love chilli fritters and have earlier pickled the chilli too. Once the idea took hold, Google came in useful. I found easy homemade Jalapenos recipe and I was good to go. The recipe is very easy and simple to make and requires some basic ingredient readily available in the pantry. It is such a shame to use store-bought Jalapenos now! Seriously!! I have used this in pizza, pasta, and just to munch on. Easy-peasy quick Jalapenos at home. Everyday pantry ingredients used to make this spicy treat. In a saucepan, combine water, vinegar, salt & sugar. Heat to a boil, stirring to dissolve sugar & salt. Add chili, and press them down so that it is submerged in pickling solution. Remove from heat and allow the mixture to sit for 10-15 minutes. 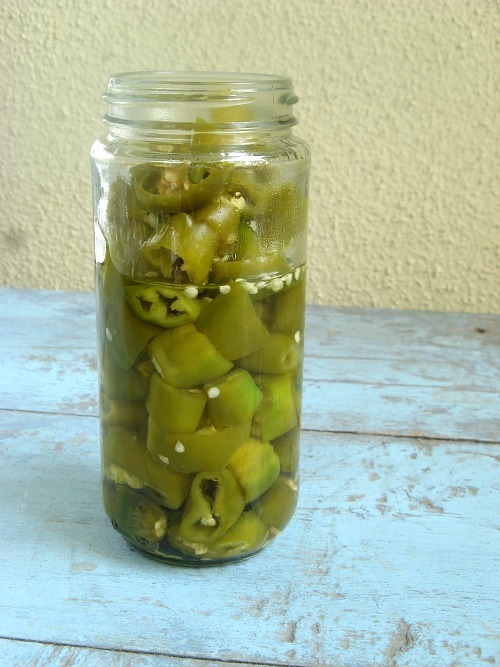 Using tongs or slotted spoon, transfer the pickled jalapenos to a clean jar. Ladle the picking juices over top. Let cool to room temperature and secure the lid. Store in refrigerator when not in use. They stay well refrigerated in a jar. Use them like you would any store bought ones.